The 867 transaction set is used in a variety of industries. It is perhaps most commonly used by retailers to communicate to their vendors on the sales of their products at individual store locations. But it can be used by manufacturers and virtually every type of reseller, including wholesalers, distributors, retailers and the like. For example, wholesalers may use the 867 to communicate to a manufacturer about the movements of their product to other wholesale locations, or to other downstream channel partners, and to detail returns from these locations to the wholesaler. The 867 is also used by utilities to communicate meter information – that is, information on usage of electricity, natural gas, etc. In addition, the 867 may be used by these utilities to transmit allowance transfer information to the US Environmental Protection Agency. The 867 is similar to the 852 transaction set, which is used by resellers to provide information on product inventory and sales levels to the manufacturers of those products. If you are a manufacturer who needs to meet your resellers’ requirements for EDI, 1 EDI Source can help. We can get you in compliance quickly, with EDI WebSource™, our premium web-based EDI portal. 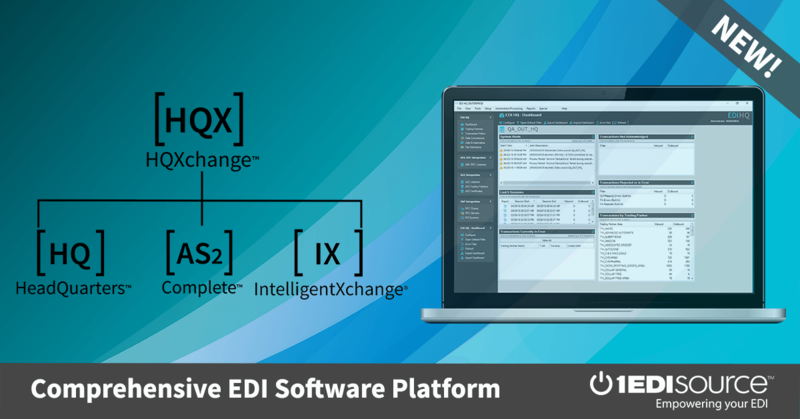 You get full EDI capabilities, in a simple-to-use and affordable solution. Contact 1 EDI Source today for a one-on-one demo with a trained EDI WebSource™ consultant. This X12 Transaction Set contains the format and establishes the data contents of the Product Transfer and Resale Report Transaction Set (867) for use within the context of an Electronic Data Interchange (EDI) environment. The transaction set can be used to: (1) report information about product that has been transferred from one location to another; (2) report sales of product from one or more locations to an end customer; or (3) report sales of a product from one or more locations to an end customer, and demand beyond actual sales (lost orders). Report may be issued by either buyer or seller.